Efficient recall of memories associated with previous stressors is crucial for survival. For instance, if one encounters a dangerous animal, the rapid recall of the memory of a previous encounter with a dangerous animal of the same type may be life saving. Brain regions involved in the recall of memory simultaneously activate the bodys stress response system, leading to increased release of stress-related neurotransmitters and neuropeptides. These in turn modulate the encoding of memory, which results in a type of feedback loop of the bodys stress response system on memory storage. Brain regions involved in memory also play a prominent role in the execution of the stress response. In the early part of this century the observation was made that, with the removal of the cerebral cortex, a hyperexcitability of anger developed, which was termed sham rage. Animals in the sham-rage state were quick to attack, and behaved as if they were experiencing a profoundly threatening situation. Papez proposed that the hypothalamus, thalamus, hippocampus, and cingulate are responsible for the behaviors of the decorticate cat. Kluver and Bucy noted that removal of the temporal lobe (including hippocampus and amygdala) resulted in psychic blindness, or the absence of anger and fear. These observations led to the development of the concept of the limbic brain, in which the brain regions listed above (and others, including the orbitofrontal cortex) mediate the stress response. The circuits constructed by these authors are no longer valid, based on the current evidence, although the individual brain regions described above as being part of the limbic system play an important role in the effects of stress on memory function. There is considerable literature claiming that stress also results in alterations in memory function. 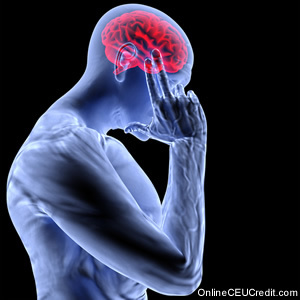 Therefore, the brain regions that are responsible for memory function and the stress response are in turn affected by exposure to traumatic stress. We review below the effects of stress on brain regions involved in memory. Stress has effects on the hippocampus, which leads to both changes in its cytoarchitecture as well as to deficits in explicit recall. Twenty-one days of restraint stress has been shown to be associated with deficits in spatial memory as measured by the radial arm maze. A release of glucocorticoids follows exposure to stress, and the hippocampus is a major target organ for glucocorticoids in the brain. In addition, the hippocampus appears to play an important role in the pituitary adrenocortical response to stress. Studies of monkeys who died spontaneously following exposure to severe stress from improper caging and overcrowding were found on autopsy to have multiple gastric ulcers, which is consistent with exposure to chronic stress, and hyperplastic adrenal cortices, which is consistent with sustained glucocorticoid release. They also suffered damage to the CA2 and CA3 subfields of the hippocampus. Follow-up studies suggested that hippocampal damage was associated with direct exposure of glucocorticoids to the hippocampus. Studies in a variety of animal species have shown that direct glucocorticoid exposure results in a loss of pyramidal neurons and dendritic branching which are steroid and tissue specific. Glucocorticoids appear to exert their effect by increasing the vulnerability of hippocampal neurons to endogenously released excitatory amino acids. The same paradigm of stress expo­sure which increases glucocorticoids and causes loss of apical dendritic branching in the CA3 region of the hippocampus is associated with deficits in spatial memory. This suggests that the effects of glucocorticoids on the hippocampus have functional implications. The hippocampus also plays an important role in emotional memory of the context of a fear-inducing situation. In conditioned fear response experiments where a tone (con­ditioned stimulus) is paired with an electric footshock (unconditioned stimulus), reex­posure of the animal to the tone will result in conditioned fear responses (increase in freezing responses, which is characteristic of fear), even in the absence of the shock. In addition, reintroduction to the context of the shock, or the environment where the shock took place (the testing box), even in the absence of the shock or the tone, will result in conditioned fear responses. Lesions of the amygdala before fear conditioning block fear responses to both simple stimuli (tone) and to the context of the footshock. Lesions of the hippocampus, on the other hand, do not interfere with acquisition of conditioned emotional responses to the tone in the absence of the shock, although they do interfere with acquisition of conditioned emotional responses to the context.9 Lesions of the hippocampus 1 day after fear conditioning (but not as much as 28 days after fear conditioning) also abolish context related fear responses, but not the fear response related to the cue (tone), while lesions of the amygdala block fear responses to both the cue and the context. These studies suggest that the hippocampus has a time-limited role in fear responses to complex phenomena with stimuli from multiple sensory modalities, but not to stimuli from simple sensory stimuli. Stress also has effects on amygdala function. The amygdala integrates information necessary for the proper execution of the stress response, including (internal) emotion and information from the external environment. Information from the environment that has emotional significance is transmitted through the dorsal thalamus to sensory cortical receiving areas, and from there to the amygdala. Emotional responses to auditory stimuli are also mediated by direct projections from the medial geniculate in the thalamus to the amygdala, which suggests that the cerebral cortex is not necessary for emotional responses to stimuli. Evidence suggests that the lateral nucleus of the amygdala is the site of convergence of stimuli from multiple sensory modalities, includ­ing somatosensory and auditory stimuli. This suggests that this region may be the site where information from unconditioned stimuli (footshock) and conditioned stimuli (tone) converge, and are translated into a final common pathway of the conditioned emotional response. The amygdala then activates the peripheral sympathetic system, which plays a key role in the stress response, through the lateral nucleus of the hypo­thalamus and the central gray, leading to increased heart rate and blood pressure, as well as activating other aspects of the bodys stress response system. Projections from the central nucleus of the amygdala to brainstem regions, including the parabrachial nucleus, dorsal motor vagal complex, and nucleus of the solitary tract, mediate the cardiovascular response to stress (increased heart rate and blood pressure). Repeated exposure to stress can result in an exaggerated startle response, which indicates an increased sensitivity of amygdala function. Very little is known about the effects of stress on dorsolateral prefrontal cortical function. Studies are currently underway using the Wisconsin Card Sort Test, which is felt to represent a measure of dorsolateral prefrontal cortical function, in PTSD patients and controls (R. Yehuda, personal communication, 1994). We have found a differential effect of yohimbine on dorsolateral prefrontal cortex metabolism in patients with PTSD in comparison with controls. Studies have demonstrated that the anteromedial prefrontal cortex (including the anterior cingulate) plays an important role in the stress response. Lesions of the an­teromedial prefrontal cortex (including the anterior cingulate) in the rat interfere with conditioned emotional responses to fear-eliciting stimuli. Specifically, these lesions result in a decrease in freezing behaviors and conditioned cardiovascular responses (increased heart rate) with fear-inducing stimuli. Lesions of the cingulate gyms increase plasma levels of adrenocorticotropin (ACTH) and corticosterone in response to restraint stress. This suggests that this area is a target site for the negative feedback effects of glucocorticoids on stress induced hypothalamicpituitaryadrenal (HPA) activity. In other words, the cingulate has a braking effect on the HPA axis system response to stress. Little is known about the effects of stress on parietal cortex function. Since the parietal cortex is involved in attention, it is reasonable to predict that the increase in focused attention which occurs during stressful situations is associated with activation of the parietal cortex. As reviewed above, studies in normal human subjects have found differences in recall during stressful as compared with nonstressful situations, with an increase of focused attention on central details of stressful situations. - Appelbaum, Paul S., Uyehara, Lisa A., & Elin, Mark R., Trauma and Memory, Oxford University Press: New York, 1997. The preceding section contained information about effects of stress on brain regions involved in memory. Write three case study examples regarding how you might use the content of this section in your practice. What part of the brain plays an important part in emotional memory regarding the context of a fear-induced situation? Record the letter of the correct answer the CEU Answer Booklet.